Perogies & Gyoza: Which is Round? Which is Bigger? Provided for review by the publisher through NetGalley. All opinions are my own. 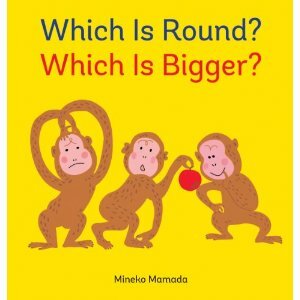 Mineko Mamada's books are huge favourites in Japan. This one, called どっちかな？(Docchi Kana? Which one?) is a bestseller, and はみがき、きらい？(Hamigaki kirai? You don't like brushing your teeth?) is a kindergarten staple. It's fantastic to see that Mamada is getting recognized internationally. I hope English-speaking audiences will enjoy her as much as Japanese audiences have. I just want to give a shout out to the translator, whoever she was. Translating a picture book is deceptively simple, but it is very difficult to capture the same rhythm. Bonus points go to the translator and editor who ensured that this is an easy reader so elementary school kids can read it on their own, the same way it is used in Japan. The concept is great- Mamada draws two items and invites the reader to compare them - then turns the answer upside down when you flip the page. Preschoolers will giggle along as a snail turns out to be faster than a dog. Then when they get bigger they can return to the book and read it for themselves. My son read this book out loud to me- and he was very quick to catch on to the rhythm. It is a perfect choice for his first semester in Japanese school, where they are learning math concepts such as comparatives and art concepts like perspective. It matches up well with the comparatives in his English curriculum introduced in the Complete Canadian Curriculum workbook for Grade 1. I love books that do double duty! This is an absolutely adorable book about thinking outside the box- great for little kids as a read aloud or for lower elementary school students looking for conceptual math books that are also easy readers! This book was on my list of the Most Anticipated Picture Books of 2013 and it was a good pick (pats self on back!). This post is for Nonfiction Monday, hosted this week by me at Perogies & Gyoza. Great review! And I agree -- translating a picture book would be very tricky. I'm glad to hear you think she did a good job with this one. And I'm glad your son likes it, too! I like the interactive twist of turning the book around. Sounds like a great pick for K-1. I haven't seen this one, but I'll keep an eye out for it. Thanks.